In the morning, half the team helped run the final kids club. Today saw another increase in kids on our final day of the club. 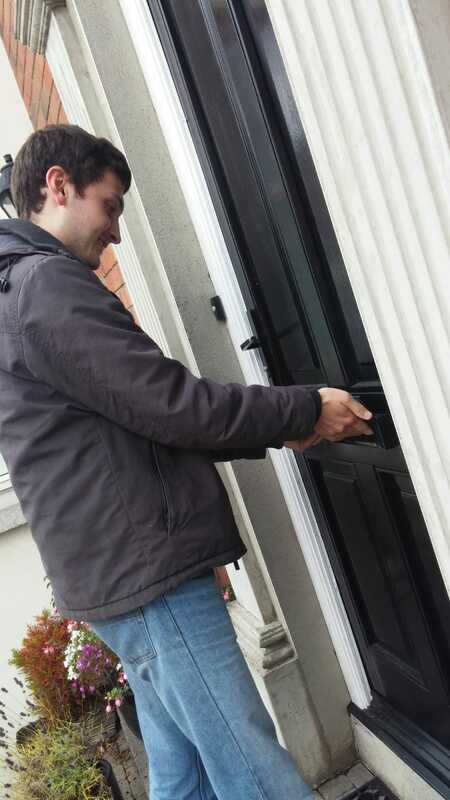 The other team members spent some time doing more door-to-door work. All pairs had at least one conversation and some pairs had more than one. 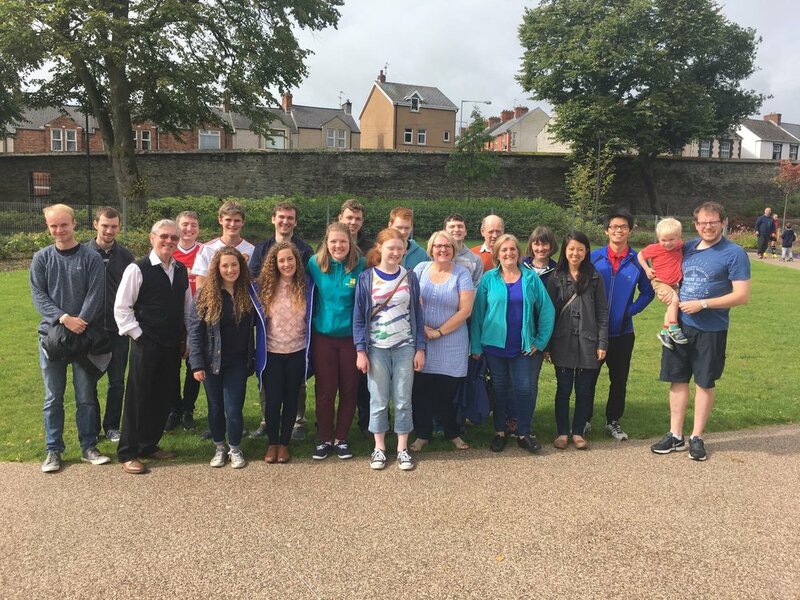 In the afternoon the team did some open air evangelism in the centre of Derry. Psalm 103, 139 and 23 were sang and explained. Anne Neilly gave her testimony. Stephen Neilly spoke about the two gates in life, the two paths of life and the two companies of life. Several passerbys lingered and some spoke to us. In the evening the team met the rest of the Gateway congregation for a fellowship lunch. After the meal the team members spoke on their reflections from the team, including encouragements and challenges from the team. - Give thanks for the kids that attended the club throughout the week. Give thanks for their enthusiasm and pray that they would remember the stories and lessons. Also pray for the parents that attended and that they would benefit from what they heard. - Give thanks for several good and encouraging conversations on the door. Pray for the lady we met who has recently began to read the bible and pray that what we spoke about would stick with her. Pray that the Spirit would be at work in all the conversations we have had this week. - Pray that those who listened to the open air evangelism would think about what they heard and would be convicted by the Spirit. - Give thanks for the time of fellowship with the congregation in the evening and pray that the team members and congregation would be encouraged by the reflections. - Pray for tomorrow's meeting. Pray for a good crowd and that he would be pleased to speak through Mark and Judith. 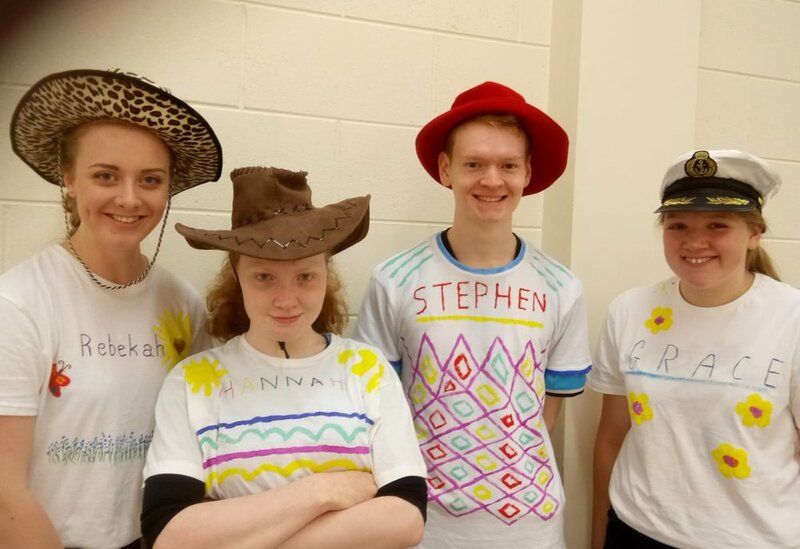 Once again we ran a Holiday Bible Club and we're very thankful for how more children attended. We kept on giving out invitations to the public meeting on Friday and we covered a lot of ground. 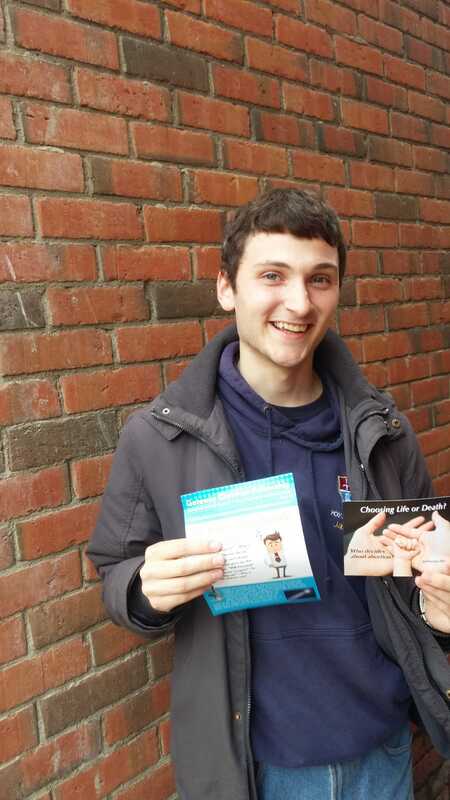 We were able to give out lots of leaflets in new estates in the city, including areas that have never previously been covered by the Gateway congregation. After lunch, we headed back out to do more door to door. Every single pair had at least one good conversation, with some having quite a few. We're very thankful for this encouragement. In the evening, we went to the Magee's house and watched God's Outlaw, about the work of William Tyndale. Give thanks for an increase in children attending the Summer Bible Club. Pray that they would remember what they have been taught. Also prayer for the parents' morning that is scheduled for Thursday. Pray that literature posted in new estates would be well received and would be read and that the Spirit would be at work in the hearts of the readers. Give thanks for the many conversations had on the doors today. Pray that people would think about the questions asked and that they would consider the truth about God and who we are in relation to him. Please continue to pray that there would be good attendance for Friday's public meeting. Also pray that God would be with Mark Loughridge and Judith Tait as they speak. We were a bit disappointed with the attendance at the Holiday Bible Club, but we're thankful for those whom God sent. The boys who came had an enjoyable time and we're so pleased to see how they engaged with the memory verse. The congregation is hosting a public meeting on Friday. It's subject is Choosing Life or Death and deals with the topic of abortion. Please pray for a good turn out at this meeting. After lunch we engaged in some door-to-door work using questionnaires. We gave out leaflets introducing people to Gateway Christian Fellowship and personal invitations to the public meeting on Friday. The day ended with dinner at the Neilly's followed by a relaxed evening of games. - Pray that more children will attend the Bible Club. Pray especially that parents who said their children would come would send them. - Give thanks for the conversations on the doors and those willing to engage with us. Pray that they would be thinking about the conversations they had and pray that the Spirit would be at work in their lives. - Pray that a good number of people would attend the abortion meeting and that God would use Mark Loughridge and Judith Tait to get the truth across. The Gateway GO Team will be helping to run a children's club from Tuesday to Thursday, so Monday was a busy day of preparing for that. They also spent some time giving out some invitations to the club. Please pray that God would bless this work throughout the rest of the week. In the evenings, the team will be studying two different books together: A Fresh Start by John Chapman and Nothing In My Hand I Bring by Ray Galea. Please pray that God would bless the team as they interact with each other. 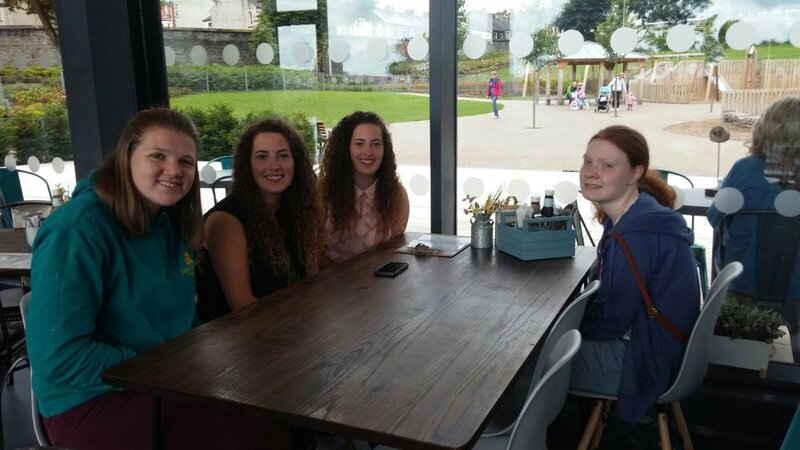 The team will be seeking to talk to people at their doors this week, please pray that God would enable them to reach people and put them in touch with the church in Derry. On Friday morning we did one last session of door to door, trying to meet people in the city who are interested in finding out more about Christianity. In the afternoon, we set up a Pop-up Café in the Cottage in Derry Craft Village and plenty of people stopped with us for tea and coffee. Give thanks for this and for how many people took literature away with them. In the evening Vincent McDonnell came to speak on Hope when all seems hopeless and the meeting was well attended with 6 new people responding to our invites. Whilst Friday marked the official end of the GO Team, the team members stayed until Saturday morning so we could have a breakfast together along with the rest of the congregation. Give thanks for the 6 people responded to invitations and pray that the talk would feed their interest in finding out more about the gospel. Pray that those who received invitations but didn't attend would still read the leaflet and that God would use it to work within them. In the morning we did more street ministry by singing Psalms 117, 112 and 23 followed by a testimony. Stephen Neilly gave a short explanation of God's word. After lunch we had a team study before heading out to distribute more leaflets and invitations to Friday's meeting. The focus this morning was on getting plenty of invitations delivered to Friday's meeting, where Vincent McDonnell will speak. In the afternoon, the team returned to doing door to door, where they continued to do questionnaires and give out leaflets and invitations. Unfortunately the public ministry planned for the evening was cancelled due to the rain. The morning began with devotions followed by the team going door to door with a questionnaire and handing out leaflets for the rest of the morning and afternoon. Give thanks for the meaningful contacts made yesterday. At 5 the team met in a park for public psalm singing with some explanation of the psalms by Stephen Neilly. Matthew Magee also gave his testimony in the open air and Stephen Neilly delivered a short message. Please give thanks for the mostly suitable weather for our door to door work and public speaking. Please also pray that the people the team engaged with on the doors would take to heart what they discussed and that God would stir interest in their hearts to find out more. Also pray that people would be interested in attending Vincent McDonnell's talk on Friday. For tomorrow, please pray again for good weather and for the ability to hand out a good number of invites in the morning and for more conversations in the afternoon when the team hopes to do more door to door. Also pray for the street evangelism as they plan to move to a more populated area. The Gateway GO Team began tonight with dinner at the Neilly's home. Give thanks for safety in travel and for this opportunity to spend time together. Next up was a time of studying: the members of the team will be reading two books over the course of the week. Please pray that Tactics by Gregory Koukl will help to equip the team for their door to door work and that Nothing in my hand I bring by Ray Galea will give the team insights into the Catholicism they will keep on encountering in Derry. The team hopes to begin door to door work on Tuesday morning, so please pray that they would have suitable weather for this. If the weather isn't good enough, they plan to do some more studying instead. Please pray that people will be open to having conversations when the door to door work begins. The team will be doing questionnaires and giving out invitations to a public meeting on Friday, where Vincent McDonnell will speak on "Hope when all seems hopeless".